Just got a heads up. 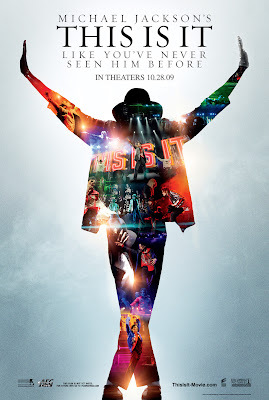 Columbia Pictures had officially released the poster of Michael Jackson's Behind the Scene Concert film, This is it. The film will provide a unique career retrospective and feature interviews with some of Jackson's closest friends and creative collaborators. The majority of the film's footage was shot in June, 2009 at STAPLES Center in Los Angeles, California, and The Forum in Inglewood, California, as Jackson prepared for "This Is It," the series of fifty concerts Jackson planned to present at the O2 Arena in London. “This Is It” will offer Jackson fans and music lovers worldwide a rare, behind-the-scenes look at the performer, his career, and the stage spectacular that would have been. The film will provide moviegoers with an unforgettable front row experience compiled from extensive footage that shows Jackson's meticulous preparation for his 2009 London shows. To be shown in limited two week engagement includign in our country, Michael Jackson's This is it film is expecting to have millions of fans gathering on cinemas and theaters starting October 28th. “Michael Jackson’s This Is It” is distributed in the Philippines by Columbia Pictures, local office of Sony Pictures Releasing International. Visit www.sonypictures.com.ph to see the latest trailers and updates about this and other upcoming films.